Wild boar (Sus scrofa) were once native to Britain and are still widely distributed across Europe. As is the case with many species, they were hunted to extinction by humans over 300 years ago and despite attempts to reintroduce boars in the 18th and 19th centuries, their long-term survival has not been successful, again, due to hunting. Adult boars can reach up to 1m at the shoulder, with adult males weighing up to 150kg. 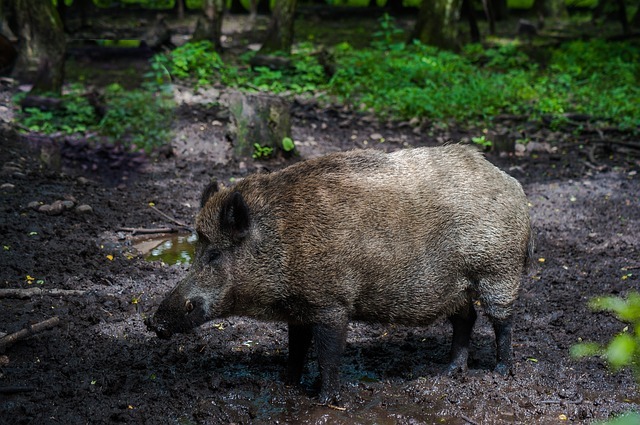 The summer coat of wild boar is bristly and dark with a ridge of long hair down the back, becoming darker brown or black in winter with thick under fur. The tail is straight, not curled. Both sexes have tusks; the lower tusks are very sharp and in males may exceed 20cm in length. Piglets are red brown to ochre coloured with yellowish longitudinal stripes for the first 4 to 5 months (wild-boar.org.uk, 2017). Boars are largely nocturnal. With the exception of the breeding season, male boars are usually solitary, however, young males can form groups when they are initially pushed out by the females. Sows live in groups with their offspring and are generally led by the oldest female. Sows give birth year round, although this peaks in the spring and summer months. Boars can reach sexual maturity in their first year and generally give birth to litters of between 5 and 7 piglets a year. Prior to giving birth, sows search out a ‘farrowing nest’ in dense cover and close to food. During this time, the group of females remain with the sow. Except for humans, boar currently do not have any natural predators in the UK. They would previously have been preyed upon by wolves and lynx. Captive boar have been present in the UK in small numbers over the last few centuries, as part of private collections, zoos and farms. An increase in farmed boar over the last 40 years, has seen escapes from captivity occurring since the 1970’s. The number of escapees increased in the 1990’s as farming for boar increased in popularity. The mid-1990’s saw reports of wild boar breeding in Kent and East Sussex; DEFRA issued a news release confirming the presence of two populations of wild boar on 21st October 1998. As a former native species, boar are adapted to survive in UK climatic conditions and appear to be finding enough food and sufficient habitat to survive and breed in the wild. There are currently thought to be between 500 and 1,000 wild animals in the UK. The largest populations are in Kent, East Sussex and the Forest of Dean, with others in Devon, Bedfordshire, Dorset and Scotland. Numbers of boar, including those found in The Forest of Dean in Gloucestershire, are reportedly growing. The original population of boar in the Forest, first established themselves in woodlands near Ross-on-Wye after escaping from a farm; this number was increased when 60 boar were illegally released in 2004. Unlike many other countries, people in Britain are not used to sharing their lives with large wild animals. Boar can be visually intimidating and some of their natural habits have led them into conflict on occasion with local communities. It has been reported that because wild boar in the UK are from farmed stock, this can mean that they are less scared of humans than their European counterparts. One of main concerns is whether they pose a danger to humans. Wild boar are large strong animals that can move quickly for their size. They will naturally defend their young if need be and can be dangerous if cornered. However, as is the case with most wild animals, they generally don’t launch unprovoked attacks on people. Boars are known to have poor eyesight but an excellent sense of smell; this means that they often move towards people and dogs to find out more about them, which can be interpreted as aggression. Dogs have been reportedly attacked in the Forest of Dean, but so far there is no commonality to the circumstances. In some areas, wild boar have been responsible for rooting up areas of amenity grassland, verges, parks and sports pitches, which has not been appreciated by the local community. 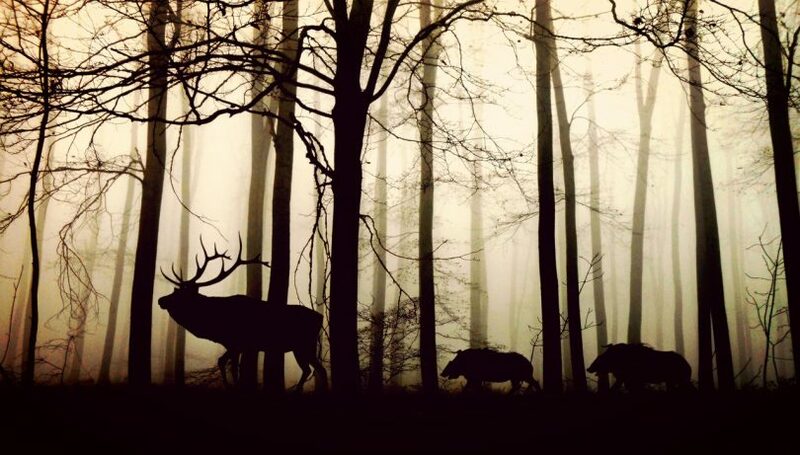 Wild boar have also been linked to exacerbating social isolation in the elderly and vulnerable, by putting people off from going out after dark in areas where boar are known to be present. Road traffic accidents are also reported as a concern. Boar have been known to feed on crops, this inevitably gives rise to conflict with farmers. There are also concerns about them spreading disease to livestock – they are known to carry bTB. Wild boar have the potential to compete for food with certain species such as those animals that rely on acorns e.g. jay, squirrel and mice. Because they are predominantly nocturnal, there may also be interactions with badger; boar have a similar diet and foraging habits to badger. Boar are generally thought to be good for biodiversity and are considered to be integral to healthy woodland ecosystems. They root around in soils and leaf-litter, which serves to mix soil nutrients and increase plant biodiversity. There has been some concern regarding boar in woodlands relating to their potential adverse effect on bluebells. 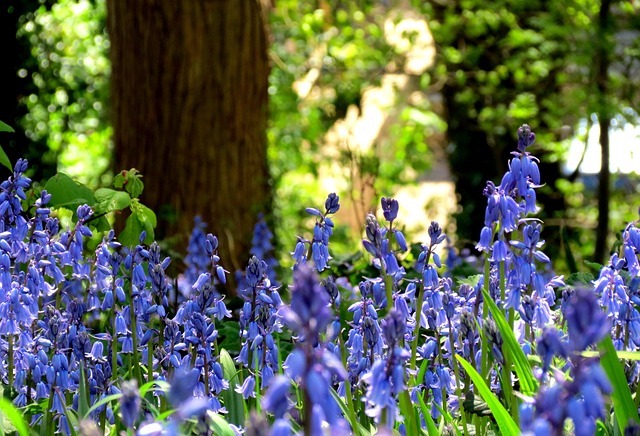 Britain is home to about 30% of the world’s bluebell population and they are often considered to be an iconic species of British woodlands (Pilgrim and Hutchinson, 2004). Current evidence suggests that if boar populations and rooting activity remain similar to those of the last 20 years then in the short-term, bluebells are not unduly threatened, although there may be a reduction in the amount of flowering. As in previous times when boar were wild in Britain, the main threat to their population is hunting. Problems of poachers shooting them at night have been reported, this in addition to other human interest in the animal, has led to boar becoming increasingly nocturnal. In Europe, wild boar are often seen in urban areas. However, to date in the UK, sightings of boar outside of rural habitat has not been reported until July 2017, where a suspected wild boar was seen in Gloucester city centre. Farmed boar are subject to the Dangerous Wild Animals Act, 1976, which means that a licence is required in order to keep them. The Wildlife and Countryside Act, 1981 regulates the release of non-native species. Part 1, Section 14 of the Act makes it an offence to release or allow to escape into the wild, any animal that is not ordinarily resident in, and is not a regular visitor to Great Britain in a wild state, or is otherwise included in Part 1, Schedule 9 of the Act. Wild boar were added to Schedule 9 in 2010. This has resulted in a grey area concerning their status in the wild. DEFRA published an action plan in 2008, which sets out the Government’s position on wild boar. The Action Plan states that as free-roaming animals they don’t belong to anyone and it is therefore up to individual landowners to control them how they see fit. Wild boar numbers have grown in the UK since their initial establishment. 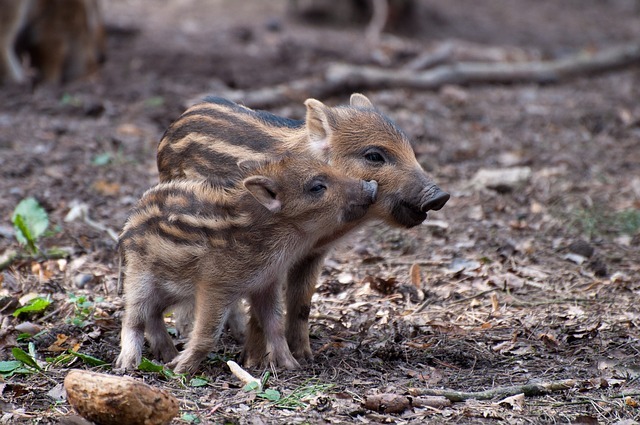 They are considered to be ecologically beneficial at low densities; however, to reduce conflicts that could arise as a result of high populations, wild boar are currently managed through selective culling – the Forest of Dean, for example, have a target population of 400 animals.